I just returned from the Delaware River Sojourn. (Another bus man's holiday for me.) This year's theme was Conserving Our Wild and Scenic River. The Sojourn was a great opportunity to commemorate the 40th anniversary of National Wild and Scenic Rivers Act. That law lead to the Wild and Scenic designation for the Upper and Middle Delaware River in 1978 (30 years ago!). Our trip went as far north as Skinner's Falls. I ended my trip at a favorite birding location, Giving Pond in Tinicum. Others continued on to Matinicunk Island, near Burlington, NJ. The Sojourn sampled different sections of the Delaware each day (each year the trip itinerary changes). One can paddle from the beginning to end, or pick and choose sections by day. Besides paddling, each day we had several rest stops that featured educational programs. These programs were excellent and cultivated discussion among paddlers as we got back onto the River. In the evenings, we shared campfires, stories and laughter. The Delaware River Corridor is awesome and inspiring. The Sojourn is worthwhile just for the opportunity to experience the natural resources protected by a variety of entities (federal, states and private). But the human resource provided by my fellow sojourners was an equally important part of the experience. I gleaned information from expert paddlers, naturalists, photographers, eco-travelers and others who shared tips, instruction and enthusiasm. It was a wonderful experience. This was my first Sojourn, but not my last. We are so fortunate to be conveniently close to a beautiful river! And we are equally fortunate to have people and groups who want to protect, improve and enjoy it! Many of those people were on, in and around the Schuylkill River from June 6th to the 13th, when the 10th annual Schuylkill River Sojourn took place. I was thrilled to be one of them. We put in at Schuylkill Haven, kayaked or canoed all day for 7 days, camped at night, and left the river at Boat House Row in Philadelphia. While the paddling was hard, everything else was easy: an outfitter transported our gear from each stopping place to the next, and all meals were provided! The people in charge were very safety conscious, and we soon learned to relax and enjoy the excitement of rapids. Over 400 people participated, usually 100-120 on a given day. Fifty-seven of us traveled the whole 110 miles. It sounds like a terrible crowd, but it was actually easy to enjoy solitude if you wanted to. At the headwaters, the river is narrow and has a lot of curves, so the crowd strung out in a long line, and often you couldn’t see the boats ahead or behind you. When the river widened, you could choose to keep a distance from other boats or to be sociable. I loved keeping close to the shore, enjoying the cool shade and listening to the birds. We were fortunate to have great weather. The river banks are green and lovely for nearly the whole length of the river—surprisingly little development right at river’s edge. Sometimes we could hear traffic sounds, but most of the time it was quiet and perfect for hearing birdsong. I was moved by the number of groups who kindly supported our endeavor. The Schuylkill Canal Association organized the Sojourn. The American Philosophical Society provided the theme and evening programs. A number of local groups such as Lions Clubs, Land Conservation groups, Canoe Clubs, and Outdoor Clubs provided the fabulous meals (I gained two pounds in spite of all the hard exercise!!!). All of these people appreciate what an asset the River is to the life of their communities, and I am grateful to them. To find out about next year’s Sojourn, go to sojourn@schuylkillriver.org. I certainly hope to go again! 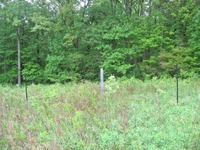 The deer exclosures at Crow's Nest have been installed since 2003: three 10 x 10 meter plots, two in woods and one in a successional area. We are starting to see some differences in these demonstration plots compared to their controls outside the fence and over the course of time. 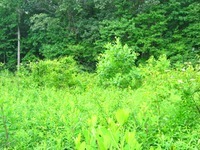 In the wooded sites there are (and have always been) large trees inside the plots. And there are seedlings in both cloaking the ground. But it is mainly inside the fences where there are the medium-size saplings growing, seedlings that have been released from deer browse. All of the successional area on Northside Road is showing a lot of new growth, but the area inside the fence exhibits the most development. The pair of photos above shows this area with three years' difference. We held the Natural Lands Trust staff picnic at Crow's Nest on Friday, and we had a great time. Here grillmeisters Drew Gilchrist and David D'Antonio work the flames to feed the hungry staff. We also played horse-shoes, and bocce ball, and had a hayride tour of the preserve, and many others hiked around. Thanks to everyone who helped and attended! Don't forget, this coming Saturday is the Great American Backyard Campout. If you need and excuse to get outside, this is it! Enjoy camping, wherever you are! We've been very busy at Crow's Nest Preserve, with spring events, getting ready for camp, and keeping up with land management. I have been spending three hours each morning controlling mile-a-minute at the preserve, and after two weeks we have covered every known population on the preserve (Kendra and Sean have also put in a good chunk of time too). This is a very peaceable activity; there are no motorized tools involved and the task takes me deep into untraveled parts of the preserve. (The tree in the photo above is one of the ways I cross the creek.) And once I start, I have to complete an area, and do a thorough job (or it is not worth doing at all) so no matter how much else needs to be done, I just have to move slowly, scan carefully, and work steadily. Afternoons are spent mowing, weed whipping, maintaining trails, or preparing for summer camp. Each evening I stop to tend the cattle, and it's very relaxing to spend time with the large, gentle beasts. So although I have been very busy it's been peaceful too. There was a great turn out for this morning's Butterfly Census (both counters and butterflies). In all we counted 19 species and 180 individuals. Not bad. Carole Mebus took this photo of a Hackberry Emperor that landed on a bunch of people before settling on Virginia's shirt. We also had this Painted Lady (photo by Carole Mebus). The top butterfly species was the Cabbage White (43 individuals). They started slow, but eventually overtook and passed the Great-spangled Fritillaries (33). One of the things that I found interesting was that we counted more Hoary-edges (15) than Silver-spotted Skippers (13). These two butterflies are somewhat similar looking at first glance, but the Hoary-edge is generally considered less common. That has certainly been the case when you review the eighteen years of census data from Mariton. So, the big increase in numbers this year is somewhat interesting. The Rhododendrons (Rhododendron maximum) have started blooming at Mariton. It looks like there will be a good show this summer. Expect to find blossoms until Independence Day, but the best looking blossoms will be between now and the end of June. Walking down to the River Lookout is a great place to admire these flowers. If you aren't up to the climb, you can see some beautiful blossoms along the Main and Chimney Rock Trails. If you come early morning or late afternoon, you should take a break on the benches at the the top of the River Lookout Trail. A male Veery has chosen the area for his territory and sings there quite a bit. Veerys (in the Thrush family) have this clear flute-like song that descends in a graceful spiral. You will notice that one of these benches is dedicated in honor of Polly Ivenz. Polly was Mariton's Program Director for 3 decades. She gets the credit for starting the Nature Day Camps, programs for schools, and even the Nature Center and its collection. She is an amazing naturalist with a great knowledge for plants. Her niece dedicated the bench in honor of her mother (Polly's sister) and her Aunt Polly. It is a wonderful place to listen to a Veery singing. We had a great morning on the Butterfly Walk. The Milkweed is beginning to bloom. This attracts butterflies and holds them on a blossom so you can focus your binoculars and look for field marks. Today, we saw some old favorites along with some unusual finds. One of the "Unusual Suspects" was a black morph Eastern Tiger Swallowtail. The Tiger Swallowtail is the familiar yellow butterfly with black stripes on its wings. But it also has a black morph which is black instead of yellow and has cream markings along the edges of the wings. I have trouble distinguishing it from the Spicebush Swallowtail and the Black Swallowtail. This morning I studied it with the guide as a reference. Next time I encounter one, we will see how well I studied. One of the interesting (non-butterfly) finds on the walk was a pair of Box Turtles mating. This Saturday, the milkweed should be perfect when we do the Butterfly Census (9 a.m. - noon). So, join us and watch some of the most beautiful creatures out there. Due to an opening in the schedule, we will have a Butterfly Walk on Tuesday, June 17 from 9 a.m. to noon. During the Bird Census, Carole Mebus and I were distracted by several butterflies. We kicked ourselves for not carrying cameras when a Eastern Comma posed on a rock for several minutes. When I got closer to examine it, the butterfly flew briefly and then landed on me and posed again. Hopefully, we will see that type of activity on Tuesday.